Credit score ranges are used to group people into buckets based on their credit score. We won't get into the complex aspects of what makes up your credit score in this article, but we will cover the basics and help you find out which credit score range you fall in. A credit score is a three-digit number that is generated using various amounts of data through an algorithm to put a numeric value on how likely it is that you are going to pay back borrowed money. Whenever you use items like credit cards or apply for loans, you are borrowing money from either a bank or company in order to pay for something up front. The credit score is the numerical value they assign to you so they can determine how much money to give you and the likelihood you'll pay them back and when. Remember, banks are for profit, so they want people who will drag out payments so they can collect the interest payments for a longer period of time. A credit score is comprised of your payment history, the amount already owed, credit history, new credit, and types of credit used. Payment History is pretty simple. It is whether or not you have made payments in the past. Amount Owed is what outstanding payments you have. Essentially it allows them to calculate how much room you have in the debt left to cover. An example would be if you have $2,000 in debt owed, but have a limit of $6,000. That difference weighs into the score to determine what you will need if applying for something requiring your credit score. Seeing how much credit you are using does factor heavily into future credit scores. Credit History is an indicator of time. The longer you have had credit the more detail they can see and the more they can project your future. New Credit is essentially how many items requiring credit have you applied for recently. The more you open in a short amount of time, the lower your score will be because the companies won't believe you can pay them back. What is Excellent, Good, Fair, Poor, or Bad? Different companies use different algorithms and methodology to calculate your credit score. We here at FBZ like to keep it simple. 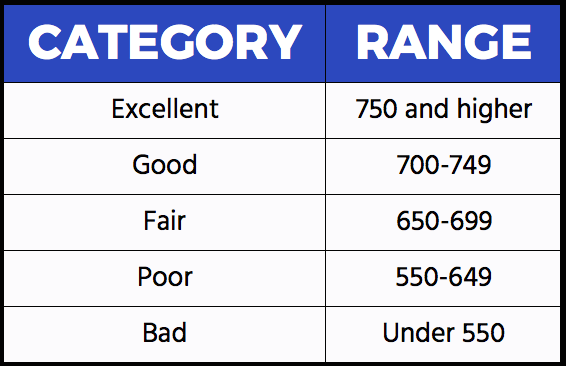 These ranges are the most heavily used in the industry and what you should refer to when finding out your credit score. If your credit score is 700-749, you are considered to have Good credit. If your credit score is 650-699, you are considered to have Fair credit. If your credit score is 550-649, you are considered to have Poor credit. If your credit score is below 550, you are considered to have Bad credit. You'll have some work to do to bring up your score over time. Personal Information-Race, Age, Nationality are *not* used for your credit score. Charge cards like American Express are included, but it is more indicative of credit history than what is outstanding because they must be paid off monthly and they have no limit. Credit score does go down after being approved. The idea is simple; you have money to spend so you are going to spend it and are less likely to have money to gain credit for other items. Time does matter. The longer you have credit, the more data points issuers can use to judge your riskiness. 63% of Millennials don't have credit cards and that can prevent them from getting rewards credit cards that require Excellent Credit or getting an affordable car loan. Credit Ratings go from 300-850 so if your number isn't in there, it is not real. Do you think credit score is an accurate depiction of yourself? Share your thoughts with us in the comments!